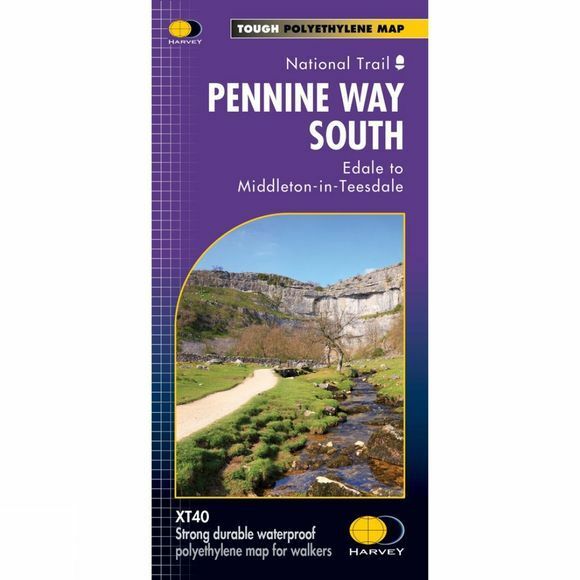 The Pennine Way South XT40 Map from Harvey covers the route from Edale to Middleton-in-Teesdale. The Pennine Way is a National Trail. It follows the backbone of England from the Peak District to the Scottish borders. It is one of the toughest UK long distance footpaths, and forms part of the European Footpath Network. The Pennine Way was Britain's first National Trail, opened in 1965. Just 2 HARVEY maps cover the whole 431km (268 miles) route. Each starts and finishes near public transport, so no hassle with getting lifts. Each also contains lots of information and useful telephone numbers to assist the walker with planning.